Question 1 Which instrument is used to study the structure of cell? Question 2 What is the basic similarity among all living organism? Question 3 Name the scientist who observed a thin slice of cork and coined the term cell? Question 4 Name 2 types of cell? Question 5 What is a cell? Question 6 Define the term cork? Question 7 What does cell theory states? There is a large variety of organism around us.They have different shapes and sizes.Their food habits and habitats are also different.Inspite of great variation all the living organism have a basic similarity among them :they are made up of tiny units called cells. Cells are the structural and functional units of life.Cork is a part of the bark of a tree.Cork is a dead plant material. In 1665,An English Scientist named Robert Hook used a microscope to investigate the structure of a thin slice of cork.HeR observed that cork had tiny compartment in it.Robert Hooke thought of these compartments as small rooms and called them cells. 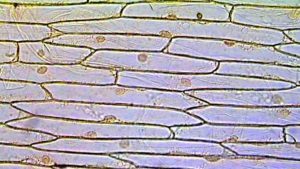 When better microscopes were made, scientists investigated pieces of living plants and found that like cork, they also had a cell structure.The living plant cell were found to contain a number of tiny structures. The cell theory states that the basic unit of structure and function of all living organism is the cell.All cells arises from pre-existing cells by cell division.The cells were not studied or observed for thousands of years because most of them are extremely small and cannot be seen with naked eyes. Cells are the basic units of life.All the living things are made up of cells.They are the building blocks of plants and animals. The simplest organism like amoeba consist of only one cell but a complex organism like man is made up of trillions of cells. A cell is the smallest unit of life which has a definite structure and performs a specific function.Most of the cells are very, very small which cannot be seen with naked eyes.They can be seen only with the help of microscope. The cells are of 2 main types:Animal cells and plant cells.